Is your dog locked inside or outside of your home again? Sick of draughts because the door is nearly always open...you have come to the right place! Can a Dog flap be installed into a glass unit? Technically there are a couple of answers to this question! Yes – providing the dog flap is no larger than a big cat/small dog. Yes – our expert glass shop can cut a hole for the dog flap in a brand new toughened glass unit, or for a cheaper solution, please contact us direct! 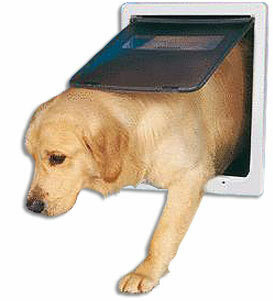 If your door is suitable you can have a flat uPVC panel installed – the dog flap will easily fit into this! Is it possible for a Dog flap to be installed into a uPVC panel? If the panel is totally flat, then there will be no problem with this! However if the dog flap is a big cat / small dog size or above, the panel will need replacing with a flat one.